After long development we are proud to reveal the latest revolutionary peripheral. Available for all Spirit units! Order while stocks last! Position Hold - Leave the sticks and just look at the model. The GeoLink will maintain position you wish. Change the spot on will. Altitude Hold - Maintaining constant altitude - no need for collective pitch input. Altitude Limit - Let the module engage the Rescue automatically once it drops under configured altitude. Limit the altitude to not exceed a level at the same time. Return to Home - Command the model to return to home wherever it is. 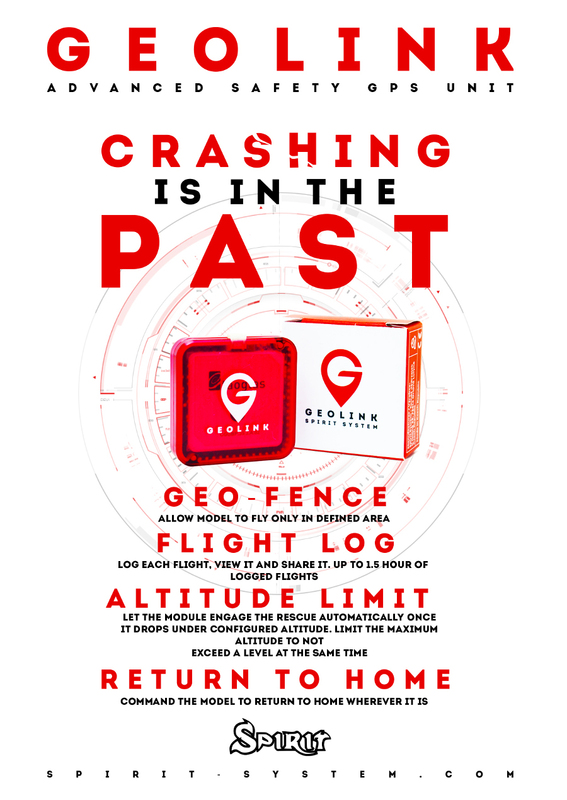 Geo-fence - Allow model to fly only in defined area. Flight log - Log each flight, view it and share it. Up to 1.5 hour of logged flights. And more - Module can be easily updated and gain brand new functions. With all these features even beginners can fly safely, learn significantly faster and to forget about stressful experience. Experienced pilots can utilize autonomous flight control to record a stunning movies, to become speed winner, to try advanced maneuvers and much more! Get the unprecedented technology for unbelievable price.